It’s our favorite night of the year! 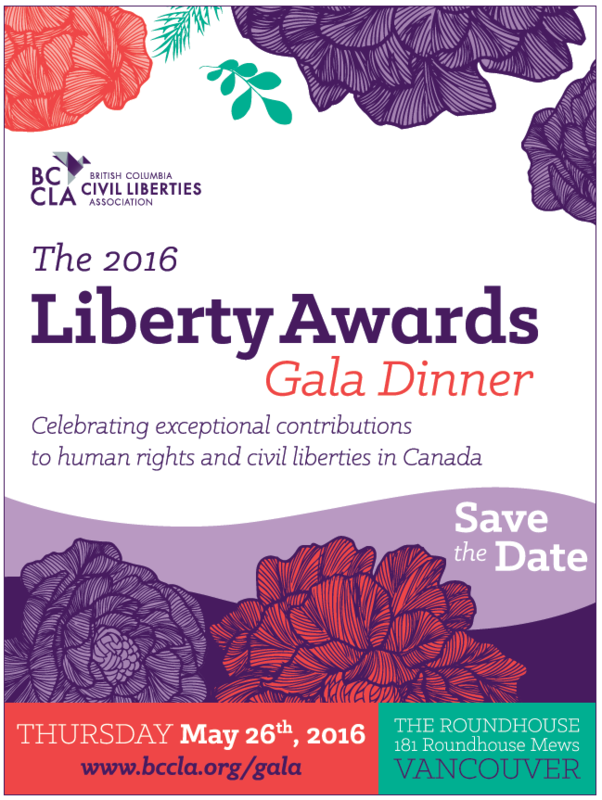 The BCCLA’s 2016 Liberty Awards Gala is coming up on Thursday, May 26, 2016 at the Roundhouse Community Arts Centre in Vancouver, BC from 6:00-9:30pm! Note: early bird pricing ends April 15, 2016. If you would like to attend this celebration but tickets are cost-prohibitive, contact us to be matched with tickets generously gifted by members and sponsors. Become a table patron! Purchase a table and support our work all year long. A full table is $2000 for 10 seats. Being a table patron means priority seating, recognition in our program, wine at your table, and more. Who will join us this year? Edward Snowden says hello! The Liberty Awards Gala has been so lucky to be supported by amazing speakers like Dr. David Suzuki, Dr. Cindy Blackstock, artists Franke James, Shane Koyczan, Susan Musgraves, and more. At our last gala whistleblower Edward Snowden made this special video for the BC Civil Liberties Association to celebrate our Excellence in Journalism award winners Glenn Greenwald, Barton Gellman, Laura Poitras, and Ewen McAskill. What can you expect? A celebration! Every year we are working to refine our program to concentrate on the things that matter— celebrating our incredible award winners, connecting with our community, and raising money to support our mission. This year’s Liberty Awards Gala will be held at the Roundhouse Community Arts Centre, a familiar venue that cleans up very nicely! Guests can expect a cocktail hour on the patio, delicious catered dinner and dessert, a short inspiring program celebrating the 2016 Liberty Award winners, and dancing with Vancouver’s premier funk band, Queer as Funk! The evening runs from 6:00pm to approximately 9:30pm with plenty of time for socializing, meeting new people, and dancing! Check out our photo gallery from 2014 to see what’s in store for you! Seating: Table purchasers are assigned reserved seating. Individual purchasers can request to be seating with friends on the ticketing page. Tax receipt: Individual ticket purchasers will receive a tax receipt for the eligible portion of ticket(s) if a mailing address is provided. A $65 tax receipt is issued for $150 early-bird tickets before April 15; a $90 tax receipt is issued for $175 regular priced tickets. Food: The Liberty Awards menu includes a three course meal with vegetarian or vegan offerings by special request. Accessibility: We provide American Sign Language interpretation, and the Roundhouse Community Arts Centre is wheelchair-accessible. If you have other accessibility requirements, please contact our office, 604-630-9745. We would like to accommodate your needs. Sponsor the Liberty Award winners! Get to know our diverse roster of 2016 Liberty Awards Gala sponsors. We NEED generous sponsors to make this night a huge success. The biennial Liberty Awards Gala is the most important fundraising event in the BCCLA’s calendar, and your support makes our critical work to protect human rights and civil liberties possible. We’re expecting more than 250 guests, and broad media coverage. Contact Charlotte Kingston, Director of Community Engagement, at [email protected] or 604-630-9745 to discuss custom options.